Founded in 1911, the New Orleans Museum of Art (NOMA) is the city’s oldest fine arts institution with a collection of almost 40,000 objects, making it one of the most renowned art museums in the South. NOMA’s grounds also include a five-acre sculpture garden. NPQ writes periodically about NOLA, including in 2016 when the city of New Orleans removed four Confederate monuments, a year before the white supremacist march and violence in Charlottesville. 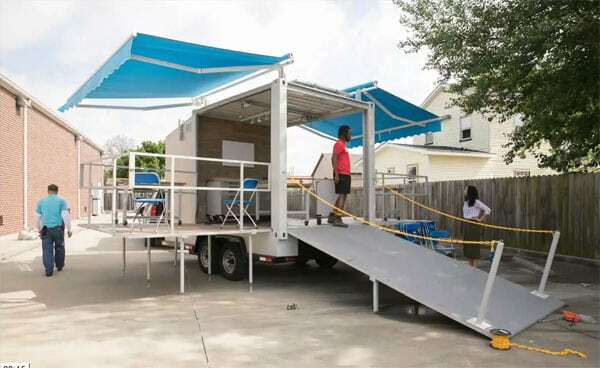 This museum on wheels is solar-powered, with ingeniously built foldout tables and retractable awnings that take just one staff member to facilitate. Matching blue chairs and rolling carts to hold art and supplies further expand its capacity to engage its visitors. Here is a time-lapse video of how fast and easy it is to bring this art museum almost anywhere to reach intergenerational audiences and demystify the stereotypical museum experience. NOMA+ is appearing at schools, community centers, and at other community locations and events such as festivals, libraries, churches, and marketplaces. NOMA+ is changing public perception of the role of art museums in the community. Nicolas Aziz, NOMA’s new community outreach coordinator, manages NOMA+. Aziz is a native New Orleanian whose own story is well worth reading here on the NOMA blog. Aziz is engaging community curators from within New Orleans’ broader creative community to help lead NOMA+ activations in coordination with NOMA’s educators. Aziz shared one of his experiences with Hyperallergic: “One of the teachers at Grace King High School, [which NOMA+ visited for a period], told me her kids feel like they’re getting some special, new, flashy toy at their underfunded school.” Hyperallergic praises this new initiative. NOMA+ expands the standard museum mold and reassembles it into one that travels to reach the seventy-two diverse neighborhoods of the Greater New Orleans area. By transforming the very design and structure of a museum, NOMA+ resists elitist narratives about who can make and engage with art. NOMA+ esteems artists by making their work accessible, such as in its collaboration with the New Orleans Photo Alliance (NOPA) and the Everyday Projects that NOMA+ launched last spring. #EverydayNewOrleans was an educational and community outreach initiative that used photography to promote a broader understanding of life across diverse neighborhoods in the Greater New Orleans region. NOMA+ manages to connect three invaluable parts of an art community: the art institution, the local artists, and the community members themselves, somehow blending and rotating all three so that the community, artists, and museums are not so distinguishable. At times, the community members become the artists, the artists become part of the museum, and the museum part of the community. By bridging forces that normally exist in separate spheres, the portable museum is successful in more than just increasing the diversity of NOMA’s visitor engagement—it dismantles the notions that “artist” is a term reserved only for those that make art for a living and “art” is reserved only for the works that appear in museums. The New York City Council has earmarked $500,000 for a public arts program that will partner youth from housing projects with nonprofit artists to create murals in and on their housing buildings.